From the moment I told my parents I won the My Royal Caribbean Cruise Adventure blog contest in early February 2011, we've been looking forward to the trip. My prize for the contest was a free 7D/5N fly-cruise trip onboard the Royal Caribbean Liberty of the Seas departing from Barcelona. The sail date was 25 Apr 2011 but we arrived 2 days earlier in Barcelona on 23 Apr. After we unboarded the cruise on 30 Apr, we extended another 4D/4N finally departing Barcelona on 4 May. The total trip duration was 14 days including time spent on flight. That's the total cost for the 3 of us for this whole trip considering that my air ticket and cruise package was free. I will breakdown further the individual costs of the cruise when I come to the entries about it. 11:05 pm (SG Time) : Take off! 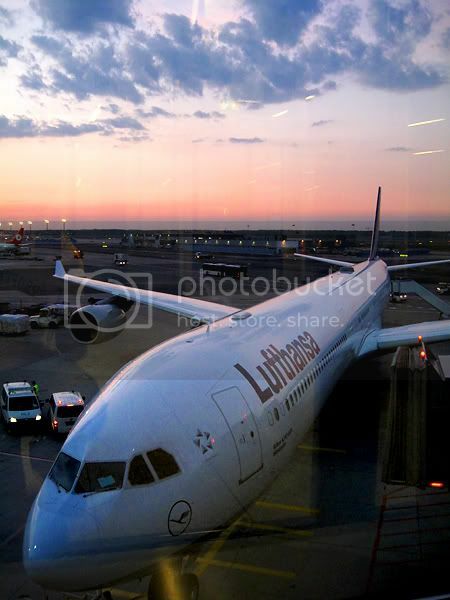 First time taking Lufthansa. Pretty good! 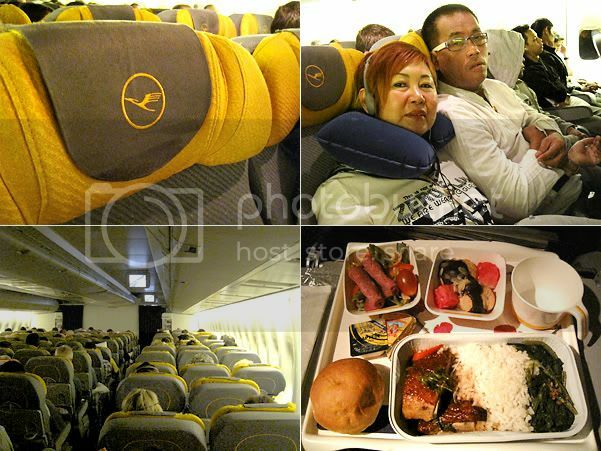 Service was friendly enough, the onboard meals were tasty (especially this duck with rice), and the seats were comfy. There was no personalised TV on our way there so BYOE - Bring Your Own Entertainment for the overnight flight. There are individual entertainment screens on the way back though and you can enjoy video and music on demand. So while my wallet is in E.R. and my bank account is undergoing surgery to stitch up the hole, here's a reality check cheque ... being a single child is really no fun when you are the sole person bearing the costs for two parents. 5:35 am (FKT time) After 12.5 hours, we arrived in Frankfurt Airport for a 2-hour transit. The sky was beginning to light up and the hues were just so beautiful. Maybe it's the effect of the grass is greener on the other side. Heh. Oh, and we got a first taste of the cool weather. Shiok! Okay, I've done my bit to help Singapore increase birth rate. Now I'll tell you a funny story. 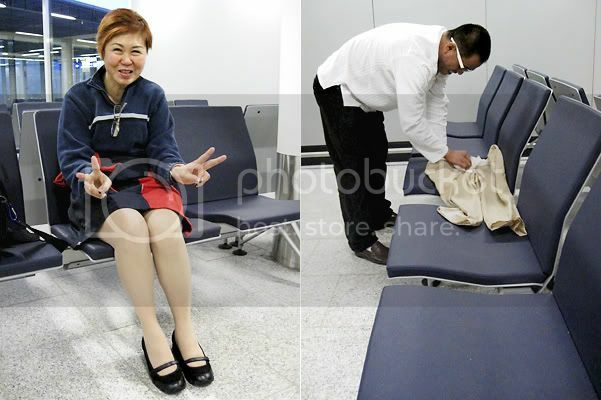 My mum 'lost' her pants and had to make a skirt out of a windbreaker when we landed in Frankfurt. It was hilarious when I saw her coming out of the airport toilet in the 'skirt' that was barely just able to contain the circumstance of those hips that bore me. But the incident that led to it gave me a rude shock. On board the flight, my mum had 2 or 3 glasses of red wine when we were offered refreshments and during dinner. Shortly after lights out for passengers to snooze, my mum called me to get her a plastic bag. Before I can pass her the puke bag, she had vomitted over herself. I don't know if it's due to the wine or she got 'airsick'. Thankfully she had a blanket over her and most of the once inside food got caught on it but some still spilt onto her trousers. Mum didn't leave Singapore behind. She brought the Merlion with her because she was puking non-stop throughout the while flight. She soiled 3 blankets and filled at least 5 puke bags. I knew because that was the number of times I went to the toilet to throw the bags as I was seated by the aisle. Poor gal. Mama lost her pants. Her slacks were soiled with red wine puke stains so she went to the toilet to wash it without first checking if there's a hand dryer in there to dry it! Well, there wasn't any. So she had to wrap a windbreaker around while we attempted to dry her pants with lots of tissue to soak out the moisture. Our adventure began earlier than I expected. I've really not seen someone who had so much vomit. I was dying inside seeing her suffer then came the shocker. She suddenly slumped back into the seat with her eyes open. She just went limp and no matter how we called her, she had no response. Nothing at all. And she was breathing funny. I felt a sharp panic. Is she having a stroke? God, please no... We kept calling and slapping her face. She would just stare ahead and not respond to us. Throughout the whole commotion, none of the flight crew came to our assistance. Maybe we weren't loud enough even though I was sure panic doesn't have a small voice. To get to the immigration, we took this travelator that has got a rather soothing ambience with the sounds of nature softly filling the space while the walls blushed with violet hues. With mum feeling better and her pants reinstated abett still wet, we continued on. That split second when mum was out was probably one of my most shocked moments. A thousand thoughts ran through my head. What are we going to do? Is there a doctor on board? Where is the air crew? What if we can't get medical help in time? I haven't touched my mum in a long time and that night, I held her hand and was massaging the nave of her neck for a long time. My left shoulder was straining after a while but somehow that connection felt good inside. She stopped puking for a while but resumed again. Oh well, I don't have that healing touch. 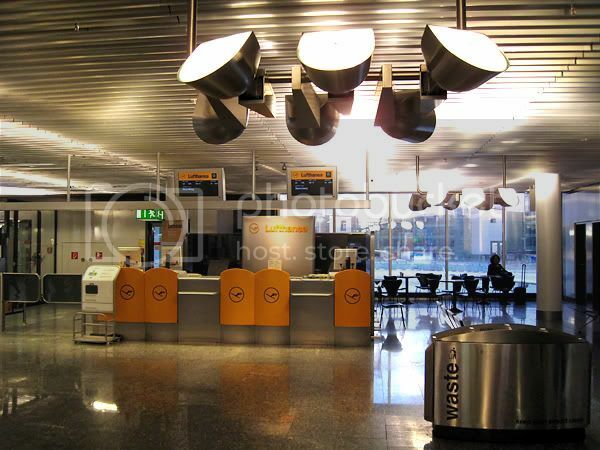 The German airport has a industrial chic about it. Stylishly metallic with a minimum of colours used made the gate signages and signboards stand out. No free wifi in the airport. There's a €2 charge for using the internet although I don't know for how long. 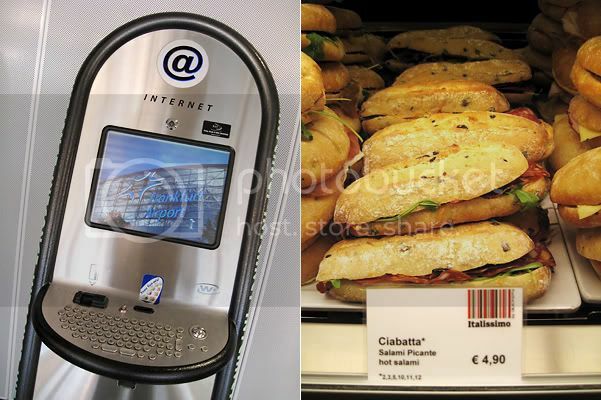 Here, we got a first taste of how expensive things are going to get in Europe after factoring in the exchange rate. A sandwich starts at around €4.50 (S$8.10) and it's not big or with fanciful fillings. There are shops and cafes here so if you can't sit still for the transit hours to pass, there is something to do. 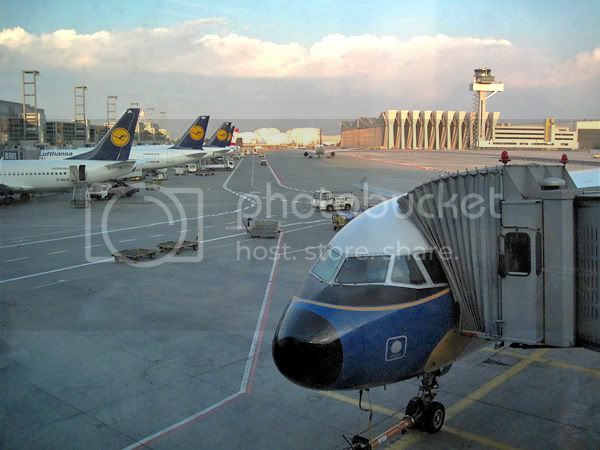 An experience I found interesting about boarding the plane in Frankfurt and Munich (transit airport on the way back) was an air of casualness. There are no special areas to hoard up the holding area of a gate and no further pre-boarding security checks. 8:00 am : Depart FKT for BCN Our transit aircraft was much smaller. 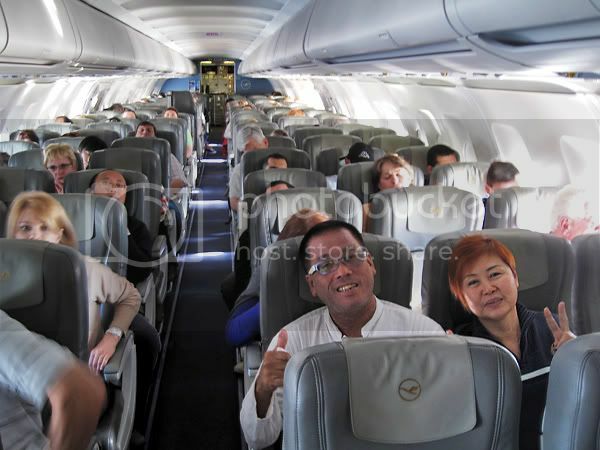 It's like taking a budget airline plane from Singapore to Kuching or Bangkok. The flight duration from Frankfurt to Barcelona was another 1hr 55mins. 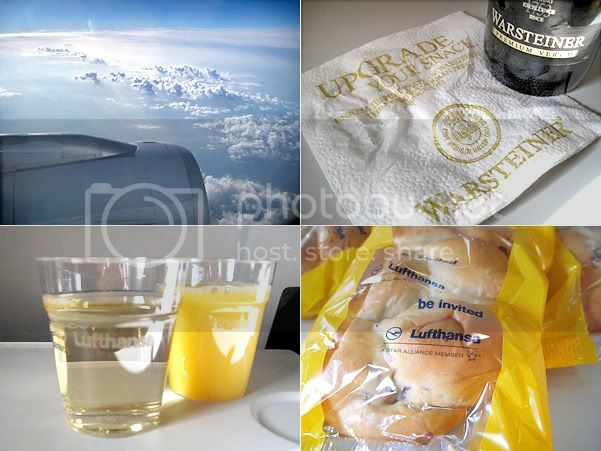 Drinks and light snacks were served onboard the transit flight. The raisin was pretty good. I had more wine and tried a local German beer that was advertised on the paper napkins. That's the beer. It has a full malty taste which may be too bitter for some but I found the flavour satisfying. It's free anyway so grab one onboard and try it out. 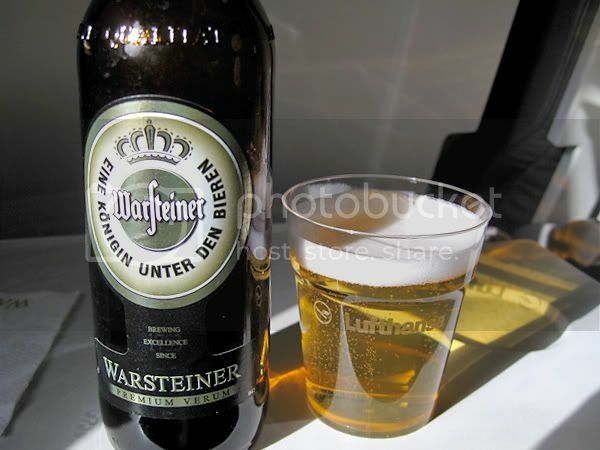 If there's one thing the Germans are known for, it's their beers. Yes, feeling good and on top of the world! We survived the long haul flight with red head Merlion. As I took this pic, I mentally prayed for a safe journey throughout, good weather, and meanigful family time. 9:55 am : Hola! We've arrived in Barcelona finally! 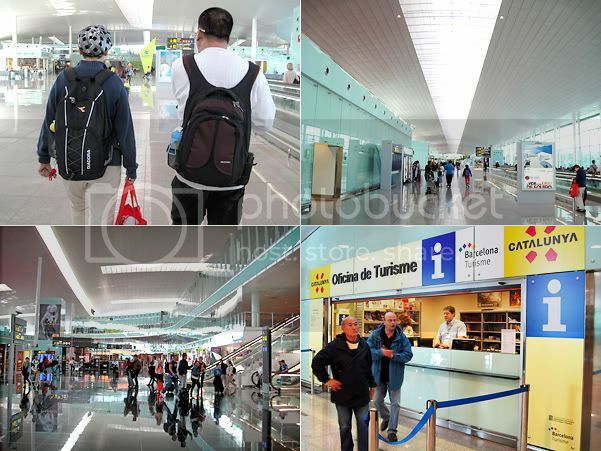 And there's such a feeling of open space at the airport with hardly any huge support beams in sight. 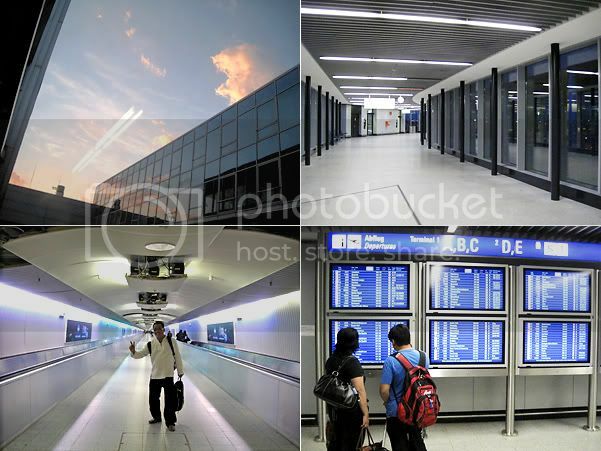 A stretch of floor to ceiling picture windows run the length of the boarding hall and flooded it with natural light. So bright and cheery! There's an information counter to the right after you exit customs and you get your maps here. 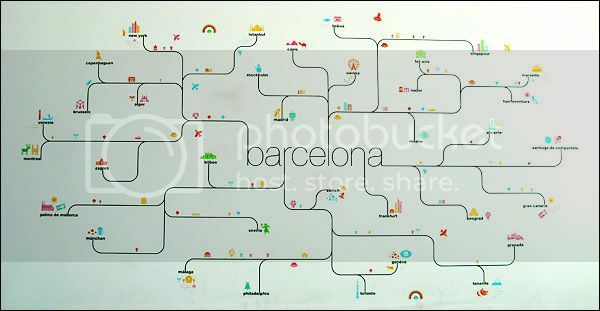 Cute illustration of all the surrounding destinations you can link to from Barcelona. Our exploration has officially begun! Thanks for a most informative and amusing blog entry! The three of you will have wonderful memories of this holiday together for the rest of your lives and your mum (as I have always remembered her to be) is such an inspirational woman who always finds the positive in every situation! I do miss her candidness and vibrant personality. You are a good son, Darren and you've made your mum very proud and loved - not just because you took her on this holiday. She loves you for who you are and treasures every moment she has with you, all to herself.